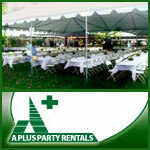 Centrally located in Southern California and doing business since the mid �80s, A Plus Party Rentals has all your party equipment rental needs. Whether you are planning a wedding, banquet, corporate event, bar/bat mitzvah, birthday or any other party, we can rent to you fine products at a fair price. With our knowledgeable and courteous staff, you will be able to feel comfortable that your event or party is in good hands. We have a very broad range of rental equipment, from your basic tables and chairs, to the latest photo booths and arcade games. View our photo gallery to see a wonderful display of our rental equipment. Take a close look at our fine china and flatware, variety of fine table linens, our white canopies and all the necessary tools to help make your event extraordinary. And now, to take us beyond the competition, we have merged with GEMS Arcades & Games, Inc. to add a special flare to your party. We have a vast inventory of arcade games including the super popular Dance Dance Revolution games. See our games page for more details. Get more for your wedding! Don't forget to mention ChossonKallah.com when visiting A Plus Party Rentals.